I grew up in a suburb of Cleveland, Ohio. That was a time when many families lived closer to each other, and we got together for every holiday. If I had never left Ohio today we would be at the Memorial Day Parade and then there would be a huge family picnic. I know this because it would be at my house. I close my eyes and I go back in time 51 years to 1960. I am not quite 15 years old, and I am wearing shorts and a matching sleeveless blouse that ties at the waist – they both had to be ironed too – no permanent press then. My pesty brother is 9 years old and running around being a pesty brother as we get ready to leave. My father is in the parade, marching with his American Legion group, and we are all lined up on the corner of Forest Ave and Ridge Road in Parma, Ohio. My grandmother hands out our flags on sticks and we leave to honor those who fought for freedom in this world. This is how our Memorial Days started when I was growing up. Later in the day we would meet at one of the wonderful parks in our Metropolitan Park System for a family picnic. All my aunts, uncles and cousins would be there. We would play Badminton, we would skip stones on the river, we would take a hike. The adults would play cards, a rousing game of Canasta, which is where I learned to play that card game. As the sun would set, we would pack up, because the mosquitos would arrive to ruin all our fun, and we would head for home. As I grew up the meaning of Memorial Day changed. I lost friends in VietNam, and these were young men who had not even started their journey down the road of life. Wars are tragic. As glamourous as Hollywood painted the earlier wars Hollywood changed with VietNam and wars were brought to the big screen where the real horror was portrayed. As a young adult I remember so well taking my children to Gettysburg and seeing in my mind’s eye, the battle that took place on that ground. Mind blowing isn’t it? When I walked across the green I was walking not only on a battlefield but on the ghosts of 45000 soldiers. Within the last 10 years I traveled to Normandy, and when I got out of the car I stood there and looked at all those white crosses, and I wept. The cemetery site, at the north end of its ½ mile access road, covers 172.5 acres and contains the graves of 9,387 of our military dead, most of whom lost their lives in the D-Day landings and ensuing operations. On the Walls of the Missing in a semicircular garden on the east side of the memorial are inscribed 1,557 names. Rosettes mark the names of those since recovered and identified. Freedom is NOT free, it comes with a price tag. While many people hail Memorial Day as the beginning of summer, the beginning of the boating season, the Indy 500, the day white shoes can come out of the closet, and more, I hail Memorial Day as a day of family memories. These are memories that will die with me because as time goes on, lives have changed, and there will be no one left to tell the stories. My dearest father, Willy, who lost his life to non-Hodgkins lymphoma at 51 years of age, if he were still here, would be retired and living in the Tampa area he so loved. He would be going to American Legion meetings or VFW halls to play Canasta or maybe Pinochle with the “boys” and today he would have gone with us to Bushnell to the Florida National Cemetery to honor our fallen soldiers, both men and women. 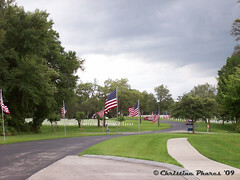 It is a beautiful peaceful cemetery – the perfect place to share memories. As I grow older I realize that there are other people in this USA that also have wonderful memories – to all of you I place my hand over my heart and say “Share those memories like I do here, with the written word.” Our younger generations who don’t appear to care (now) they will one day, and if we are gone, who is going to tell them?